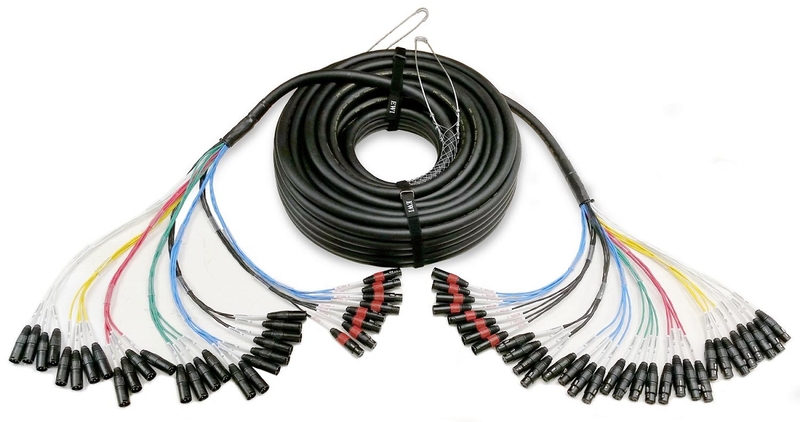 The EWI DF-PPX-24-8 series snake is a 24 channel XLR send snake with 8 XLR returns in a dual fantail configuration. On each XLR fantail, the channels are clearly labeled with indelible ink printed on the tubing at each connector. The channels are in color coded groups of 4 ea., and each group of 4 is bundled with 3 short, loose fitting pieces of clear loom that can be slid up or down the fantail as desired, This helps keep the fantails from getting tangled and facilitates easy channel identification. The fantail length is about 19" on the male XLR end with a functional spread of about 36" and 14" on the female end with a function spread of about 24". The main trunk is constructed with EWI SMC cable which is 32 individual shielded pairs, 22 ga., high copper purity conductors with double aluminum foil shield and trace wire, which is heavy duty, and very flexible. The connectors are all EWI ESF/MB-GDP 3 pin XLR models. Mesh grip strain relief on both XLR fantails.